Joseph Segal and wife Rosalie are widely recognized in British Columbia - as much for their philanthropy as for their business acumen and entrepreneurial vision that have helped shape BC's business community. Joseph Segal built a merchandising empire that included Zeller's and the Bay. Then, as president of Kingswood Capital, he made his mark in manufacturing, real estate and venture capital funding. 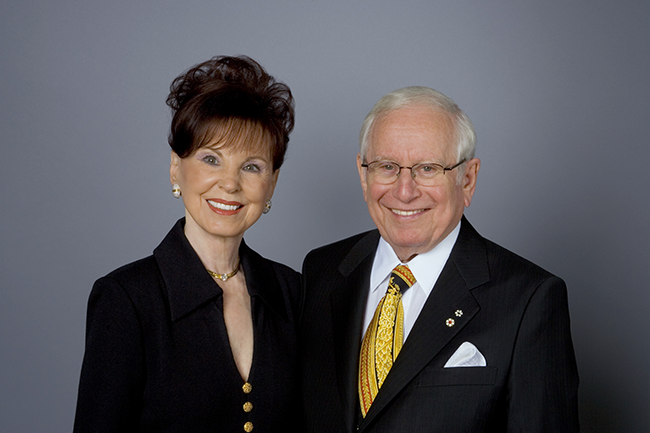 Together, Joe and Rosalie have made significant contributions to their religious community, to Simon Fraser University, to Vancouver and to Canada. These have been recognized with the Order of Canada, the Order of BC and the 2005 Variety Club International Humanitarian Award. Dr. Segal, a Chancellor Emeritus of Simon Fraser University, has for the past two decades championed the University's expansion into downtown Vancouver, spearheading the campaign to establish Harbour Centre, playing a leadership role in the creation, development and renovation of the Morris J. Wosk Centre for Dialogue. And for more than 20 years, Dr. Rosalie Segal has quietly assisted dozens of SFU students with special needs. In 2002, Joseph Segal and his family donated the former Bank of Montreal heritage building as the home for the renamed Segal Graduate School of Business. Today, the School is home to Simon Fraser University's MBA, EMBA, MSc Finance, Management of Technology MBA, PhD and Graduate Diploma in Business Administration programs. Read more about Joe Segal and his contribution to Simon Fraser University.